Fredericksburg, TX We visited Austin, TX for the Easter weekend for my nephew’s 5th birthday. While we were there, we took a day trip to the Texas Hill Country town of Fredericksburg, about 1.5 hours drive from Austin. Fredericksburg was a quaint little town, with pronounced German influence filled with art galleries, restaurants serving German inspired cuisine and wineries specializing in Texas hill country wines. We stopped at the Torre di Pietra Vineyards – a Tuscan inspired winery, primarily because that was the winery that my brother in law and sister in law patronize. We did taste a few different varieties of wines and I found one that I liked – a sweet red wine called Red Flirt. The winery had a herb garden and vineyard and some benches and gazebos for us to drink the wine and nibble on the cheese and crackers that they provided. After wine tasting, we visited a nearby Wildflower farm and that proved to be the highlight of this day trip. 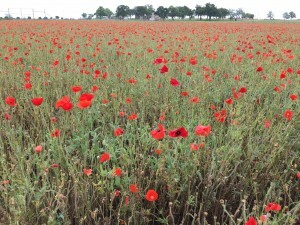 Although the bluebonnets were gone, the poppies were in full bloom. We managed to get some lovely family pictures with the background of the poppy field. We had a late lunch at a restaurant called Rathskeller that had a curious mix of German influenced food such as sausages and schnitzels but also Tex-Mex food such as quesadillas and southern food like chicken fried steak. The food was what I would call “strictly ok” – but the variety helped with 4 kids who all wanted different kinds of food. Crayola Factory While it was primarily aimed at kids, the sheer variety of crayons and colors led to even the adults coloring away at the Crayola Experience in Easton, PA. Crayola had just announced that Dandelion – a yellowish orange colored crayon- that was part of the standard 24 color pack was being retired and was to be replaced by a bluish shade. Dandelion, therefore, was the focus of attraction from all visitors. There were different activities for kids at the factory: stations to print your own name tag for a crayon, get crayons in the shape of a ring or a car, any number of coloring options, create art with melted crayons, the history of crayons and a large water-table with crayola boats. The wrap it Up station was hands down the favorite of our group of kids, the ability to put your own name on a crayon was far too exciting and the kids spend a lot of time trying to come up with inventive name on the crayola wrapper. 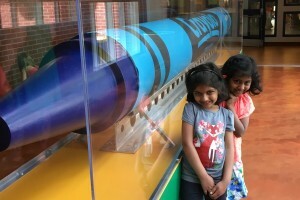 I was a little disappointed to see that this was a Crayola Experience and not the Crayola Factory : the key difference being that no crayons are manufactured here, but the kids really didn’t care too much. My personal favorite was actually the giant crayons and markers outside the factory – they were fun to take pictures with. While this was age appropriate for the older kids, it wasn’t so much fun for Tanay. There was a little play area with a climbing space and lighted pegs – so that kept him busy for a while. My over all verdict was that it was worth a trip once but doesn’t really have repeat interest. We did not have lunch at the Factory but walked a little to a restaurant called Touch of Thai. The food was good but the service was even better. We didn’t have much leftovers and we weren’t planning on packing up whats left but the owner insisted on packing up the rice and sauces for us. Don’t stop at McDonalds – this is healthier for the kids, she said as she packed up some rice and sauce for us to feed the kids later. We were walking back to the Crayola factory when Annika tripped and skinned her knee. If it weren’t for her skinned knee, we would have walked past the historical marker at that location. This was the birth site of Florence Siebert – an American biochemist (born in 1897) who identified the active agent in tuberculin and was instrumental in developing the PPD test for TB! Its always inspiring to hear about the achievements of women scientists – especially those who studied and worked in times that were not friendly to women researchers. A couple of my undergraduate engineering friends are based in the New York area. We have made an unofficial pact to meet up atleast once a year for at least a day or two– typically this has been around Fall. Planning this trip is always a challenge – the venue needs to be somewhere that is easily accessible to both the New Yorkers and DCites, it can’t be too cold and should be child friendly. 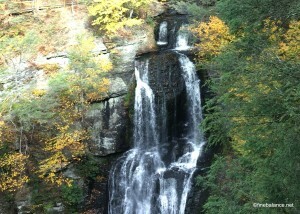 Our chosen destination for this year was Bushkill Falls & Dingman Falls in Poconos. 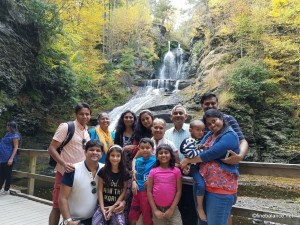 This year my mom and Sarika’s parents joined us – so we were in total a group of 12. We first went to Dingman falls and some of us hiked all the way to the top of the falls. The falls colors were beautiful, the waterfall was delightful and the company was awesome. One of the best things about this trip is to see how our kids have become friends and they look forward to the trip almost as much as we do! After a rather hurried lunch, we went to the Bushkill falls area. There was a playground for the kids, they also did some mini golf and we all got to do some boating. The Bushkill falls is famously called the Niagara of Pennsylvania. There are well marked and very easy trails to see the falls from different angles. The falls have a 100ft drop – but the amount of water was miniscule compared to Niagara. The setting was amazing though – fall colors make everything look magical. Keep in mind though that the falls are privately owned and you do have to shell out a pretty penny to go and see them. Typically temples are never on my travel list but when a structure has been labeled the largest Hindu temple in the world, it definitely gains a spot on my must-see list. The Akshardham temples are run by devotees of Bhagwan Smainarayan (1781-1830). The Swami Narayan followers are a sect of Hindus (primarily from Gujarat) who believe in a living guru who is the spiritual incarnation of the original Swami Narayan. While their philosophy is to practice austerity in life and a strong message of social service, there is no trace of austerity when they build their temples. These BAPS temples are present in 10 different cities around the world and they all rival each other for size and grandeur. We visited the temple in Robbinsville, NJ which is a 12,000 sq ft behemoth structure and touted as the world’s largest temple. I was surprised to see it being referred to as the “small temple” but was informed that this is so because a larger temple is being built in the same lot. The grandeur of the building is unparalleled and it was clear that no stone was left unturned into creating this magnificent edifice. The temple which is 42 ft tall and 133 ft long and 87 feet wide is completely built of Italian Carrera marble – around 68,000 cubic foeet of it. The marble was excavated in Italy, shipped to India where local artists painstakingly carved every square inch and then it was shipped to USA. 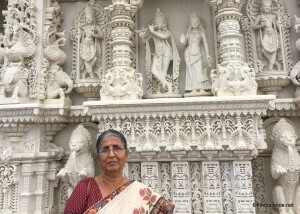 The temple has about 14,000 individual intricately carved pieces including arches, decorative grills, peacocks and figures of both mythological saints and historical persons. 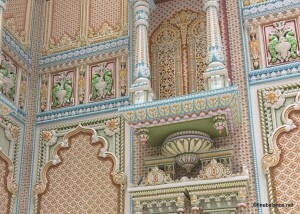 The work put into this temple is astounding. Photography is not allowed within the temple but you can take pictures outside. It was impossible not be awestruck by the work of the artists. I did have to tamp down by inner snarky voice – all this money and effort on a temple when they could have served public better by building hospitals or schools. But I could appreciate it as an artistic creation. The BAPS temple also had a small market and food court with incredibly delicious snacks and good items. I might recommend going there just to stock up on Gujarati snacks and farsan alone.